I no longer take post-workout shakes. And I recommend you no longer take them either. Let me clarify…I still take a whey shake (with some creatine in there) – I just drink it DURING my workouts, not immediately after. In fact, I’ll start sipping on this shake a set or 2 into my session. So why make the change? Training itself is catabolic i.e. it breaks muscle down. The reason we take a shake so soon after training is to give the body what it needs to get into an anabolic (building) state. However, the catabolic effects of training are underway from the beginning of the workout. The quickest way to get protein into your system is whey protein mixed in water. This will enter your bloodstream at the rate of about 10g protein per hour. But if your workout lasts for an hour, you’ll only BEGIN this process after you’ve already been catabolic for an hour. Why allow this to happen? It’s much better to have your shake during your workout so that by the time it’s over, you’ve already delivered 10g protein to your hungry muscles. As I recommend 40g protein in a post-workout shake, the remaining 30g will be delivered over the following 3 hours. Since whey in water is the fastest method of delivery, you really can’t do any better than this! NOTE: For my US readers I recommend Optimum Nutrition Whey and for all my European readers I highly recommend Impact Whey from MyProtein. As a side-note, this study  had 2 groups train and take either a pre-workout or post-workout shake. 50% of those in the pre-workout group had greater amino acid uptake than those in the post-workout shake group. Now, as long as you have eaten a normal protein/carb/fat meal sometime before training, you don’t need to make this a pre-workout shake. However, those of you who have to train first thing in the morning on an empty stomach, should take some whey before training. Perhaps make a 50g shake and have some of that before training, and the rest during your workout. A protein-only shake first thing in the morning has the added benefit of spiking growth hormone levels (up to 3 times, see here). So, with decreased catabolism and starting the anabolic process a little sooner, you should experience better results over the long term (this isn’t a quick fix). Of course, all this counts for nothing if your workouts aren’t up to scratch. Download the most growth-promoting workout I know below. THT training is free. After inputting your email, you will be taken directly to the download page for instant access to the workout. There is no need to go and confirm your email. P.S. With easy-to-make protein-packed recipes to fuel your muscle growth, MuscleHack Buff Baking makes eating healthy feel like a cheat meal. There’s pancakes, peanut butter cookies, ice cream, “strong man’s” sausage bake, chocolate cake, “popcorn” chicken and many more! Check it out here. Stimulation of net muscle protein synthesis by whey protein ingestion before and after exercise. Am J Physiol Endocrinol Metab. 2007 Jan;292(1):E71-6. Epub 2006 Aug 8. Tipton KD1, Elliott TA, Cree MG, Aarsland AA, Sanford AP, Wolfe RR. Great. Short and to the point. Makes sense. Thanks again Mark. So the same amount of protein, just take it from the first set? @Larry. Yes bud. 40g as per usual. Start sipping from the beginning of the session. It should be pretty much gone by the end. 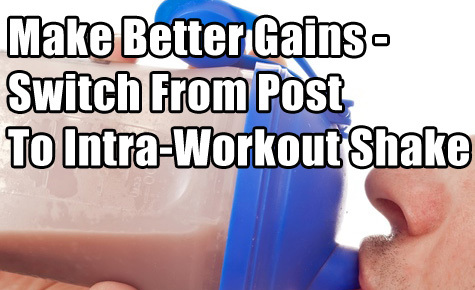 What do you think about sipping on a BCAA drink during training and then having a post-workout shake as per normal? Overkill? Pointless? Or equally effective? @Ryan. I think it’s pointless and a waste of money, buddy. Read my take on whey vs BCAAs here https://www.musclehack.com/whey-vs-bcaas-which-is-best-for-building-muscle/ Save your money. I’ve been following your program for 10 weeks , my diet is spot on and I train till failure. My strength is up a little but I’m not seeing any real changes in my body shape , not sure what to do? @Craig. Your getting enough protein every day? Enough calories? Enough sleep, water? Not consuming too much alcohol? What cycle of THT – 3-day or 5-day buddy? Mark, i’ve got a question. What i usually do is that have my post-workout shake right after my workout and then have my post workout meal after 1 hour. Should i tweak my post workout meal timing too? Or just take it as the old way? What’s your saying? And thanks forall the work you do for us people! Can’t thank enough! Keep up the Good work! As with all your posts, this one definitely makes sense. Works well as it also means I don’t have to wait too late in the evening to have some dinner! It appears that a dose of BCAA should add to this effect. @Ismail. You don’t need to change it. A good rule of thumb is that your solid food meal comes any time within 3 hours of training finishing. The protein from the meal will break down much slower and keep the anabolic process up for hours. Mark, I workout alone so what would you recommend for doing squats to failure? We have a smith machine and power rack. So I guess something like that is safer. But I’ve read everywhere were certain trainers don’t like people using smith machines for squats.I just started this workout and I couldn’t complete first day guess I’m just out of shape felt like I was going to throw up. Lol but that’s a good thing. Hi Ryan, I use a Smith Machine for squats all the time & train alone as well. I have a few knee issues & feel sooo much safer using a Smith Mach! Works for me! Mark, if I have about 60g of protein (50/50 whey/solid) about 90mins before workout I should be ok, yes? Typically have post workout shake about 3 hours after this meal. So should be anabolic throughout the workout? Here in Syria we don’t have any supplements. So if I could only eat food what would you recommend for pre-workout, intra-workout, and post-workout? Okay all this info is great but what about the fellas like myself 55 years old I have been working out since high school but now its getting a little tougherneed a real kick start what do you suggest? hi mark!wanted to know your take on decreased blood supply in the gut during workout.there lots of articles for or against a hypothesis.so can’t make them a base for our decisions!thnkx. As soon as I wake up I take whey..but I also a grab a banana or little Oats… And then I train… Should I cut oats n banana and just use Whey ?? Mark would this be recommend for post-workout shake for JnR as well? I usually take a PWO that is packed with BCAAs, and have already eaten probably close to 100 grams of protein by the time I work out that day. Then 16oz of whole milk with Ovaltine mixed with 20 grams of my custom protein blend when I finish training (38 grams). This of course is always followed by a meal or three. Livestrong tells us in their article on overrated supplements that whey hydrostate is no better than isolate or concentrate for protein synthesis. Many seemingly reasonable outfits advise that protein around the time of workout should be conflated with digestive enzymes appropriate to protein breakdown to enhance the effect of drinking whey. Is there any need for digestive enzymes. I make up my own shakes, according to some of your recommendations Mark. I have a pre-workout shake about 20 minutes by starting my routine, containing 30 g whey, 3 g beta-alanine and 2 g AAKG. I had previously also added taurine and BCAA’s, but I’m not sure these made any difference. I also put a teaspoon of instant coffee in it for the caffeine. I take my post-workout shake immediately after finishing my routine. This also contains 30 g whey, 5 g creatine and 5 g glutamine. This regime seems to be working well for me. Do you think this is ok? By the way, I moved from the UK to Canada a few months ago. I previously used Myprotein.com and couldn’t find a similar site in Canada. Supplements in the shops were super expensive and the websites in the US were also expensive to order from. After searching a bit I found Canadianprotein.com. The products, prices and service are the best I’ve ever seen. I have nothing to do with this company – I just use them – but I would recommend any Canadian readers to check out the site if you’re having trouble getting supplements. @Mike. MCT only when cutting, as it acts kind of like a carb and I keep my carbs on the low side when cutting. @Jon. That’s not true. IIFYM only applies to the 24 hour period. Targeted nutrition around the workout is true and scientific. You simply put your body into a catabolic state when training. You could leave it hours to eat after your workout and still meet your cals and macros for the day, but you simply will build less muscle unless you counter to catabolism early on. @Ryan Daley. I think you can squat safely in a power rack. If you get in trouble, you just do the negative slowly and rack it. Just my opinion. @Richard. 60g of protein (50/50 whey/solid) about 90mins before workout will be fine for you, you can then wait until your next meal to eat. @Mike. 55 still younger than a lot of other guys lifting. Best thing – download THT! Start on the 3-day/week plan. @dr sunil. Not even something I’ve ever thought about or the relevance of it. @KRS. Yes you can do this on JnR too. So it doesn’t matter what kind of protein I eat before, mid, and after workouts? Like digesting speed and so. I’m thinking big meat/fish/poultry meal before workout, soy beans and water during workout, and whole eggs after workout. Plus dairy before sleep. @Yesser. All solid protein will break down quite slowly. Eggs are the best solid protein. Have them before. A solid protein intra-workout won’t work well. Just eat a egg or chicken meal as soon as you can after finishing. Mike-55 and older. Nice to see there are others who still train after all the decades of life’s challenges. Follow all of Mark’s recommendations on THT, diet, protein, sleep, etc. The best you will find anywhere. But realize that you are indeed older now (who, me?) and listen to your body on certain things. You’re not going to respond to training, bulking, cutting, recuperation like you (and I) did when we were 18-25. If you are genetically gifted, good for you! But pay attention to old injuries or potential injuries on weak points like knees, hips, shoulders, lower back. And range of motion/stiffness. You may find like I have that you have to substitute alternative movements for things like squats, power cleans and shoulder presses to avoid injury. Before you go headfirst into any heavy training program (especially with a younger partner!) take an inventory of all recent joint soreness/weakness and tailor your movements and lifts to accommodate your body. You won’t be sorry. You can always add stuff later if you feel confident and your muscle groups can take the pounding. Otherwise take it conservatively and do everything that you can, as vigorously as you can, without injury, and progress from there, at your own pace. You’ll still look better than 99% of all the 55 year-olds out there! Bottom line? Don’t wuss out and use non-productive pansy workouts, just don’t kill yourself either, trying to keep up with the “kids.” Mark, please comment? You’re the expert. I began weight training in earnest in my 50’s and I am now 68. I have been doing it long enough to know how to squat and below thighs parallel to the floor slowly to make it harder but with maximum effort holding 50 # dumbbells on my . The same is true for military presses and I put dumbbells in a back pack for parallel dips for strength and pullups for strength. I have a difficult time imagining myself strong enough to hurt myself, nevertheless, I do warmup movements and study how to workout with punctilious form. I typically exercise 5 to 6 days a week depending on change up of my workouts that take me about an hour. I go for protein shakes embellished with cinnamon, the flavor of which I esteem in great measure and I have a stash of BCAA but I will use it on non-workout days when I fast part of the day. On workout days I workout early in the morning and shortly after I finish I have a breakfast of pancakes I make from oat bran, coconut flour, almond flour, eggs, more whey powder, and I put a few strawberries and Fage Greek yogurt (beware of Yoplat, Dannon, or any that are made by giant corporations that contaminate their so-called yogurt with added sugar and things like sucralose.) I usually eat a lime an hour or two before I workout (lemon water is suppose to be good for you first thing in the morning but the only lemons I can find are labelled by a giant food corporation and I do not trust giant food corporations) and I take a scoop of creatine and beta-alinine and I might try something with 150 grams of caffeine and l-citrulline because I like the effect or sensation that follows exhausting a muscle group that it seems to cause. So far I took second place in the men over 60 bodybuilding contest held by OCB. I will try to outdo myself next year. Due to ceilac disease I had been in the hospital and when this happens I can’t get food down for several days so I try to make up for it by taking BCAA to supplement the IV the hospital gave me. But this is different from when I can take whey isolate from cows that have not been given hormones or antibiotics and the whey is cold processed before I workout and I will try it between sets during workouts. Thanks for your response just try to keep motived any tips on trying to keep focus and keep the drive going.